A Magnificent Set of "Art Knives" by Fabrizio Silvestrelli! 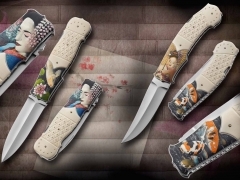 Fabrizio is one of the premier and best known knife makers in Italy. His work is Amazingly clean and detailed and shows his love for the art of knife-making. This Fabulous set of 2 knives consists of a Fighter blade and a Dagger blade shaped Folder. These knives were then engraved by Master Mario Terzi and then painted and hot enameled with a magnificent "Geisha and Coi" theme. The knives are sold as a Set.